It was my Birthday week and I had planned a few leaves during this week to enjoy an extended weekend. Now once the leaves were approved, it was obvious to think about how to best utilize the time and nomadic soul was sure to tempt us to move out of the city. Travel is where our heart is and so we started thinking of options. After due considerations accorded to multiple options, we realized that during our last tour of South India, we did miss out on a few places we wanted to go. The family still being in Chennai did strengthen the idea of going to the region and hence we planned another trip to this wonderful part of the country. As per the plan we were at our familiar airport - Indira Gandhi International Airport in Delhi - on the evening of July 5th, 2016. Yeah, before we left house, I was in for a surprise as wifey had made a delicious chocolate cake at home. We had a sort of celebration after which we took our cab to the airport. We were departing from the Domestic Terminal - T1 as we were booked on Indigo flight at 10 PM and after the usual check-in and security drill, we waited at the Plaza Premium Lounge on the Air Side of the terminal. Courtesy to our HDFC's Diners Club cards, we had complimentary access to the lounges across India and we always make it a point to exploit the luxury to the extent possible. Our flight departed on time and we landed at the Chennai International Airport at around midnight. Since it was pretty late and few airlines flew at that time, we expected baggage arrival times to be shorter but they took their own time to get the bags on the belt and so we were only out of the airport by 1 AM. The driver was waiting, perks of coming to the home, and we boarded the vehicle with the excitement of another great trip in our hearts. We reached home in about half an hour and spent another hour chatting over how things were. The late night mom's special tea does wonders and the day's exertion seemed to vanish in no time. We finally called it a night in the wee hours of the next day. It was a work day for me and hence I spent most of the day interacting with the clients virtually and wrapping up emergent tasks that couldn't wait until the next week. It was late afternoon when I proudly announced that the working part of this week was over and I was now a free man. I expanded my wings and flew across the house to let everyone know that I was ready to begin my Birthday celebrations. We all had a round of tea and snacks over family banter to spend the rest of the evening in a fun environment. Towards the late evening, we had planned to leave for Tirupati, a religious destination of inexplicable importance. Accordingly, the car was at our home to pick us around five and we began the journey around 5:30. We passed through the busy roads of this metro city and were soon cruising on the highway towards the temple town. We took a couple of short coffee breaks en route and were in the city limits by about 7:30 in the evening. 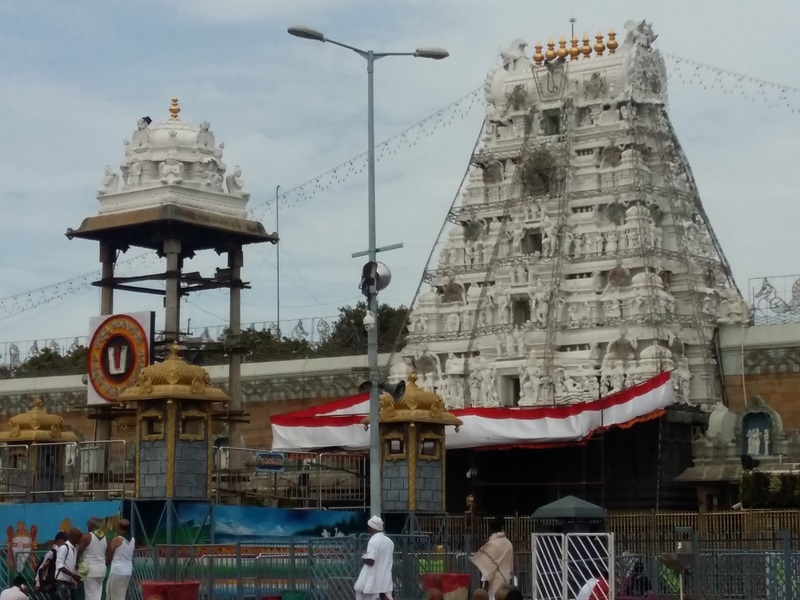 The journey included about half an hour of ascending on the Tirumala Hill, the peak of which is the seat of the temple. We had been reserved in the Temple Trust's guest house and we checked in the facility. Strong winds blowing through the area created a serene environment which was enhanced by an unannounced downpour. A little while later, the dinner was served in the temple canteen and we were amazed at the entire system. The food was brought in mammoth tiffins and by any expectations, the food could feed an entire army. We literally had only a small part of the food that was brought in and requested the temple authorities to utilize the unused food in the best possible way. It was then that we were informed that no food is wasted there and they serve in a manner that the remaining food is perfect for consumption of other devotees coming to the temple. With a sigh of relief, we gorged on the South Indian delicacies served in front of us. Post dinner, we strolled on the streets of this holy hillock and enjoyed the breeze and coolness of the air. We were asleep by about 11 in the night as next was going to be an early morning. Next morning we had darshan scheduled at 7:30 AM and hence we were up early in the morning. While the purpose was Darshana, the early morning did provide us with scenic views of hills and surroundings. After freshening up we proceeded towards the temple premises. As we entered the queue area, we realized the extent of importance this place carried and the crowd thronged the queues in large numbers. There are various categories of lines based on the amount you pay with waiting time ranging from 2 hours to 12 hours. We were in the highest band and joined the relatively shorter queue. The queues are bound in metal cages and at the start of the cages, we were made to get through an entire security drill - checking of passes, checking personal belongings and providing brief instructions. We moved ahead and soon were asked to wait in one of the waiting areas - one of many seating areas where devotees waited in batches. Each area was opened to let the entire batch into the temple premises. The Tirumala Hill is 3200 ft above sea level and is about 10.33 square miles in area. It comprises seven peaks, representing the seven hoods of Adisesha, thus earning the name, Seshachalam. The seven peaks are called Seshadri, Five persons are allowed for Shrivari Darshan. Laddus will be given after darshan. Laddu Padi tickets are sold at Vijaya Bank. Neeladri, Garudadri, Anjanadri, Vrishabhadri, Narayanadri, and Venkatadri. The sacred temple of Sri Venkateshwara is located on the seventh peak, Venkatadri (Venkata Hill), and lies on the southern banks of Sri Swami Pushkarini. Lord Venkateshwara at Tirumala is regarded as the world’s richest temple with an estimated annual income of over 300 crores. In about 20 minutes we were at the entrance of main part of the temple, where the statue of Lord Balaji is kept. Though people tend to push and chaos to a certain extent is expected, the line which we were part of was relatively smooth and relaxed. Apparently, the more you pay, the closer you get to God. Our queue was allowed to almost pass through the temple sanctum. Amidst the rush and guards requesting to make it quick, we got our time to have the darshan in peace. The divine moment stayed with us for at least a minute while we kept my eyes on the most desired statue at sanctum sanctorum. The main statue is an eight-foot-tall idol of Lord Venkateswara adorned with gold, diamonds, and flowers and standing under the gilded dome, Ananda Nilaya Divya Vimana. According to the various sources of information, on any given day the main deity is adorned with not less than a hundred kilograms of gold, diamond and pearl ornaments. Of all the ornaments, which adorn the deity, “Makara Kanti”, “Lakshmi haram”, “Shaligrama haram”, “Suryakatari” (golden sword believed to have been presented to the Lord by the Sun God) are of immense antique value their history being rooted in legends. Aside from the recently made diamond crown, the other ornaments such as “Nagabharanams”, “Sankhu-Chakram”, “Kati Hastham” and “Abhaya Hastham” are also made of gold and diamonds. The “Golden Dhoti” (peethambaram) made of pure gold laces is the heaviest of all his “costumes”, weighing about 40 Kg. While coming out from that main part of the temple, there is another chamber where one can write his/her wish with a coin and drop that coin there itself. When the secret wish accomplishes, the person has to come back to say “Thanks”. Once we were out, we were offered the prasad - delicious boondi laddoos served in paper bowls. The laddoos are prepared with ghee and dry fruits and are heavenly after hours of waiting for darshan. For those interested, there is also a free food service from the temple management to feed the devotees. By about 10, we were out in the temple courtyard, where one can spend time shopping for souvenirs or collect memories in lenses. We did a little bit of both and came back to our room. In about a little while from then we were in our car rushing towards Chennai. We had an evening train to catch to continue the tour to newer cities and exciting times.